ATTENTION TO ALL PINOY MUSICIANS! 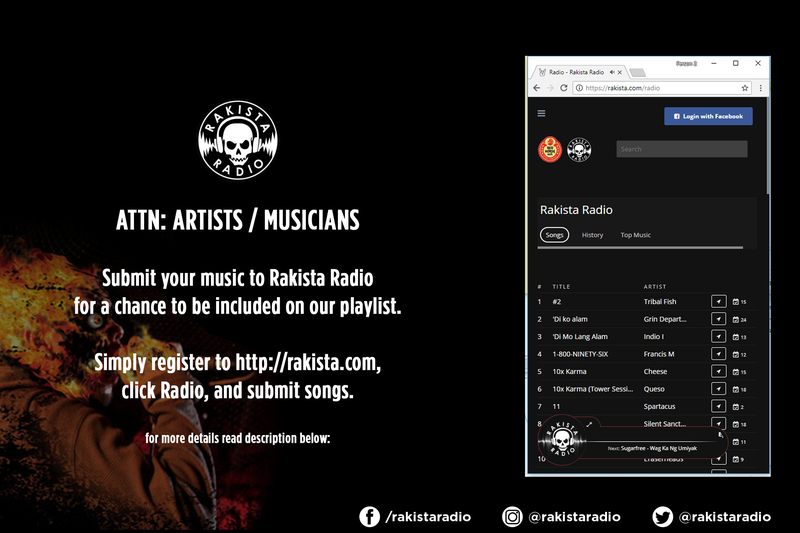 – A New And Easy Way To Submit Your Music And Be Heard On Rakista Radio! Rakista Radio, the no.1 online radio station that plays 100% Pinoy Rock, has a new, better, and easier for artists to submit their music and be included on our playlist. 1. Use your Facebook account to register as an artist, click the Login with Facebook button. 2. Fill up all the required information; don’t forget to choose “Artist” as profile type. 5. Wait for the status of your song, as the Rakista Radio team will review your material for approval. Once your music was approved, it will be automatically included on Rakista Radio’s library and listeners can search and request your song. Most requested songs will be featured every week so keep those requests coming. Please be reminded that all songs are subject to review by the Rakista Radio team and will not guarantee inclusion on our playlist.